This article is about Scandinavia as a cultural-linguistic region. For the broader group of northern European countries including Finland and Iceland, see Nordic countries. For the peninsula, see Scandinavian Peninsula. For other uses, see Scandinavia (disambiguation). Scandinavia[b] (/ˌskændɪˈneɪviə/ SKAN-dih-NAY-vee-ə) is a region in Northern Europe, with strong historical, cultural, and linguistic ties. The term Scandinavia in local usage covers the three kingdoms of Denmark, Norway, and Sweden. The majority national languages of these three, belong to the Scandinavian dialect continuum, and are mutually intelligible North Germanic languages. In English usage, Scandinavia also sometimes refers to the Scandinavian Peninsula, or to the broader region including Finland and Iceland, which is always known locally as the Nordic countries. 3 Use of "Nordic countries" vs. "Scandinavia"
The name Scandinavia originally referred to the former Danish, now Swedish, region of Scania. Scandinavia and Scandinavian entered usage in the late 18th century, being introduced by the early linguistic and cultural Scandinavist movement. The majority of the population of Scandinavia are descended from several North Germanic tribes who originally inhabited the southern part of Scandinavia and spoke a Germanic language that evolved into Old Norse. Icelanders and the Faroese are to a significant extent descended from the Norse and are therefore often seen as Scandinavian. Finland is mainly populated by Finns, with a minority of approximately 5% of Swedish speakers. A small minority of Sami people live in the extreme north of Scandinavia. The Danish, Norwegian and Swedish languages form a dialect continuum and are known as the Scandinavian languages—all of which are considered mutually intelligible with one another. Faroese and Icelandic, sometimes referred to as insular Scandinavian languages, are intelligible in continental Scandinavian languages only to a limited extent. Finnish and Meänkieli are closely related to each other and more distantly to the Sami languages, but are entirely unrelated to the Scandinavian languages. Apart from these, German, Yiddish and Romani are recognized minority languages in parts of Scandinavia. "Scandinavia" refers to Denmark, Norway and Sweden. Some sources argue for the inclusion of the Faroe Islands, Finland and Iceland,[a] though that broader region is usually known by the countries concerned as Norden (Finnish: Pohjoismaat, Icelandic: Norðurlöndin, Faroese: Norðurlond), or the Nordic countries. Scandinavia originally referred vaguely to Scania, a formerly Danish region that became Swedish in the 17th century. The use of "Scandinavia" as a convenient general term for Denmark, Norway and Sweden is fairly recent. According to some historians, it was adopted and introduced in the eighteenth century, at a time when the ideas about a common heritage started to appear and develop into early literary and linguistic Scandinavism. Before this time, the term "Scandinavia" was familiar mainly to classical scholars through Pliny the Elder's writings and was used vaguely for Scania and the southern region of the peninsula. 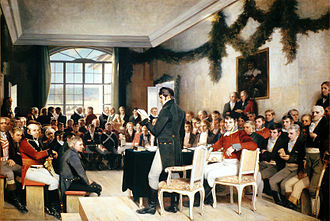 As a political term, Scandinavia was first used by students agitating for pan-Scandinavianism in the 1830s. The popular usage of the term in Sweden, Denmark and Norway as a unifying concept became established in the nineteenth century through poems such as Hans Christian Andersen's "I am a Scandinavian" of 1839. After a visit to Sweden, Andersen became a supporter of early political Scandinavism. In a letter describing the poem to a friend, he wrote: "All at once I understood how related the Swedes, the Danes and the Norwegians are, and with this feeling I wrote the poem immediately after my return: 'We are one people, we are called Scandinavians!'". The clearest example of the use of Scandinavia is Finland, based largely on the fact that most of modern-day Finland was part of the Swedish kingdom for hundreds of years, thus to much of the world associating Finland with all of Scandinavia. However, the creation of a Finnish identity is unique in the region in that it was formed in relation to two different imperial models, the Swedish and the Russian, as described by the University of Jyväskylä based editorial board of the Finnish journal Yearbook of Political Thought and Conceptual History. Various promotional agencies of the Nordic countries in the United States (such as The American-Scandinavian Foundation, established in 1910 by the Danish American industrialist Niels Poulsen) serve to promote market and tourism interests in the region. Today, the five Nordic heads of state act as the organization's patrons and according to the official statement by the organization its mission is "to promote the Nordic region as a whole while increasing the visibility of Denmark, Finland, Iceland, Norway and Sweden in New York City and the United States". The official tourist boards of Scandinavia sometimes cooperate under one umbrella, such as the Scandinavian Tourist Board. The cooperation was introduced for the Asian market in 1986, when the Swedish national tourist board joined the Danish national tourist board to coordinate intergovernmental promotion of the two countries. Norway's government entered one year later. All five Nordic governments participate in the joint promotional efforts in the United States through the Scandinavian Tourist Board of North America. Use of "Nordic countries" vs. "Scandinavia"
While the term "Scandinavia" is commonly used for Denmark, Norway and Sweden, the term "Nordic countries" is used unambiguously for Denmark, Norway, Sweden, Finland and Iceland, including their associated territories (Svalbard, Greenland, the Faroe Islands and the Åland Islands). Scandinavia can thus be considered a subset of the Nordic countries. Furthermore, the term Fennoscandia refers to Scandinavia, Finland and Karelia, excluding Denmark and overseas territories, but the usage of this term is restricted to geology when speaking of the Fennoscandian Shield (Baltic Shield). Svalbard, which is under Norwegian sovereignty, is not considered part of Scandinavia as a cultural-historical region, but as a part of the Kingdom of Norway (since 1925) it is part of the Nordic countries (Norden). Whereas the term "Scandinavia" is relatively straightforward as traditionally relating to the three kingdoms of Denmark, Norway and Sweden there exists some ambiguity as regards the ethnic aspect of the concept in the modern era. Traditionally, the term refers specifically to the majority peoples of Denmark, Norway and Sweden, their states, their Germanic languages and their culture. In the modern era, the term will often include minority peoples such as the Sami and Meänkieli speakers in a political and to some extent cultural sense as they are citizens of Scandinavian countries and speak Scandinavian languages either as their first or second language. However, Scandinavian is still also seen as an ethnic term for the Germanic majority peoples of Scandinavia and as such the inclusion of Sami and Finnish speakers can be seen as controversial within these groups. 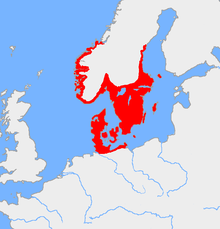 The original areas inhabited (during the Bronze Age) by the peoples now known as Scandinavians included what is now Northern Germany (particularly Schleswig-Holstein), all of Denmark, southern Sweden and the southern coast of Norway while namesake Scania found itself in the centre. Scandinavia and Scania (Skåne, the southernmost province of Sweden) are thought to go back to the proto-Germanic compound *Skaðin-awjō, which appears later in Old English as Scedenig and in Old Norse as Skáney. The earliest identified source for the name Scandinavia is Pliny the Elder's Natural History, dated to the first century A.D. Various references to the region can also be found in Pytheas, Pomponius Mela, Tacitus, Ptolemy, Procopius and Jordanes, usually in the form of Scandza. It is believed that the name used by Pliny may be of West Germanic origin, originally denoting Scania. 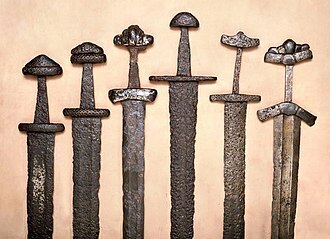 According to some scholars, the Germanic stem can be reconstructed as *skaðan- and meaning "danger" or "damage" (English: "scathing", German: Schaden, Dutch: schade). The second segment of the name has been reconstructed as *awjō, meaning "land on the water" or "island". The name Scandinavia would then mean "dangerous island", which is considered to refer to the treacherous sandbanks surrounding Scania. Skanör in Scania, with its long Falsterbo reef, has the same stem (skan) combined with -ör, which means "sandbanks". 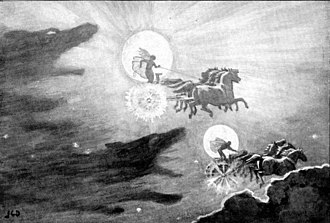 The Old Norse goddess name Skaði, along with Sca(n)dinavia and Skáney, may be related to Gothic skadus, Old English sceadu, Old Saxon scado and Old High German scato (meaning "shadow"). Scholar John McKinnell comments that this etymology suggests that the goddess Skaði may have once been a personification of the geographical region of Scandinavia or associated with the underworld. Pliny begins his description of the route to Scatinavia by referring to the mountain of Saevo (mons Saevo ibi), the Codanus Bay (Codanus sinus) and the Cimbrian promontory. The geographical features have been identified in various ways. By some scholars, "Saevo" is thought to be the mountainous Norwegian coast at the entrance to Skagerrak and the Cimbrian peninsula is thought to be Skagen, the north tip of Jutland, Denmark. As described, Saevo and Scatinavia can also be the same place. Pliny mentions Scandinavia one more time: in Book VIII he says that the animal called achlis (given in the accusative, achlin, which is not Latin) was born on the island of Scandinavia. The animal grazes, has a big upper lip and some mythical attributes. The name "Scandia", later used as a synonym for Scandinavia, also appears in Pliny's Naturalis Historia (Natural History), but is used for a group of Northern European islands which he locates north of Britannia. "Scandia" thus does not appear to be denoting the island Scadinavia in Pliny's text. 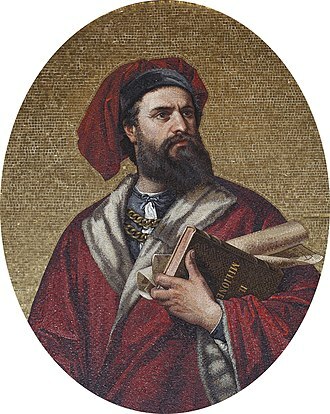 The idea that "Scadinavia" may have been one of the "Scandiae" islands was instead introduced by Ptolemy (c. 90 – c. 168 AD), a mathematician, geographer and astrologer of Roman Egypt. He used the name "Skandia" for the biggest, most easterly of the three "Scandiai" islands, which according to him were all located east of Jutland. The Latin names in Pliny's text gave rise to different forms in medieval Germanic texts. In Jordanes' history of the Goths (AD 551), the form Scandza is the name used for their original home, separated by sea from the land of Europe (chapter 1, 4). Where Jordanes meant to locate this quasi-legendary island is still a hotly debated issue, both in scholarly discussions and in the nationalistic discourse of various European countries. The form Scadinavia as the original home of the Langobards appears in Paulus Diaconus' Historia Langobardorum, but in other versions of Historia Langobardorum appear the forms Scadan, Scandanan, Scadanan and Scatenauge. Frankish sources used Sconaowe and Aethelweard, an Anglo-Saxon historian, used Scani. In Beowulf, the forms Scedenige and Scedeland are used while the Alfredian translation of Orosius and Wulfstan's travel accounts used the Old English Sconeg. 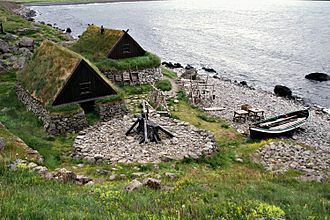 The earliest Sami yoik texts written down refer to the world as Skadesi-suolo (north Sami) and Skađsuâl (east Sami), meaning "Skaði's island". 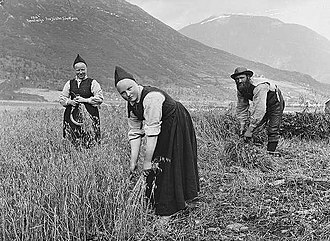 Svennung considers the Sami name to have been introduced as a loan word from the North Germanic languages; "Skaði" is the giant stepmother of Freyr and Freyja in Norse mythology. It has been suggested that Skaði to some extent is modeled on a Sami woman. 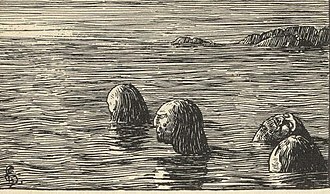 The name for Skade's father Thjazi is known in Sami as Čáhci, "the waterman"; and her son with Odin, Saeming, can be interpreted as a descendant of Saam the Sami population. Older joik texts give evidence of the old Sami belief about living on an island and state that the wolf is known as suolu gievra, meaning "the strong one on the island". The Sami place name Sulliidčielbma means "the island's threshold" and Suoločielgi means "the island's back". Another possibility is that all or part of the segments of the name came from the Mesolithic people inhabiting the region. In modernity, Scandinavia is a peninsula, but between approximately 10,300 and 9,500 years ago the southern part of Scandinavia was an island separated from the northern peninsula, with water exiting the Baltic Sea through the area where Stockholm is now located. Some Basque scholars have presented the idea that the segment sk that appears in *Skaðinawjō is connected to the name for the Euzko peoples, akin to Basques, that populated Paleolithic Europe. According to some of these intellects, Scandinavian people share particular genetic markers with the Basque people. The geography of Scandinavia is extremely varied. Notable are the Norwegian fjords, the Scandinavian Mountains, the flat, low areas in Denmark and the archipelagos of Sweden and Norway. Sweden has many lakes and moraines, legacies of the ice age, which ended about ten millennia ago. 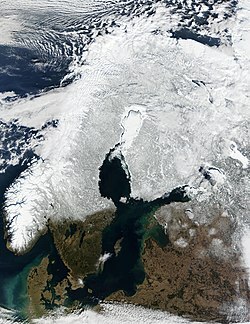 The southern and by far most populous regions of Scandinavia have a temperate climate. Scandinavia extends north of the Arctic Circle, but has relatively mild weather for its latitude due to the Gulf Stream. Many of the Scandinavian mountains have an alpine tundra climate. The climate varies from north to south and from west to east: a marine west coast climate (Cfb) typical of western Europe dominates in Denmark, southernmost part of Sweden and along the west coast of Norway reaching north to 65°N, with orographic lift giving more mm/year precipitation (<5000 mm) in some areas in western Norway. The central part – from Oslo to Stockholm – has a humid continental climate (Dfb), which gradually gives way to subarctic climate (Dfc) further north and cool marine west coast climate (Cfc) along the northwestern coast. A small area along the northern coast east of the North Cape has tundra climate (Et) as a result of a lack of summer warmth. 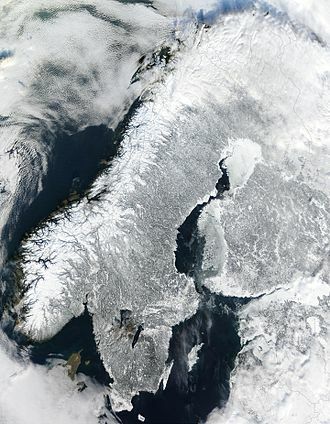 The Scandinavian Mountains block the mild and moist air coming from the southwest, thus northern Sweden and the Finnmarksvidda plateau in Norway receive little precipitation and have cold winters. Large areas in the Scandinavian mountains have alpine tundra climate. Southwesterly winds further warmed by foehn wind can give warm temperatures in narrow Norwegian fjords in winter. Tafjord has recorded 17.9 °C in January and Sunndal 18.9 °C in February. Two language groups have coexisted on the Scandinavian peninsula since prehistory—the North Germanic languages (Scandinavian languages) and the Sami languages. Due to later migrations, Finnish, Yiddish and Romani have also been spoken for over a hundred years. Denmark also has a minority of German-speakers. More recent migrations has added even more languages. Apart from Sami and the languages of minority groups speaking a variant of the majority language of a neighboring state, the following minority languages in Scandinavia are protected under the European Charter for Regional or Minority Languages: Yiddish, Romani Chib, Romanes and Romani. The North Germanic languages of Scandinavia are traditionally divided into an East Scandinavian branch (Danish and Swedish) and a West Scandinavian branch (Norwegian, Icelandic and Faroese), but because of changes appearing in the languages since 1600 the East Scandinavian and West Scandinavian branches are now usually reconfigured into Insular Scandinavian (ö-nordisk/øy-nordisk) featuring Icelandic and Faroese and Continental Scandinavian (Skandinavisk), comprising Danish, Norwegian and Swedish. The modern division is based on the degree of mutual comprehensibility between the languages in the two branches. The populations of the Scandinavian countries, with common Scandinavian roots in language, can—at least with some training—understand each other's standard languages as they appear in print and are heard on radio and television. The reason Danish, Swedish and the two official written versions of Norwegian (Nynorsk and Bokmål) are traditionally viewed as different languages, rather than dialects of one common language, is that each is a well-established standard language in its respective country. Danish, Swedish and Norwegian have since medieval times been influenced to varying degrees by Middle Low German and standard German. That influence came from not just proximity but also that Denmark and later Denmark-Norway ruling over the German speaking region of Holstein, and in Sweden with its close trade with the Hanseatic League. Norwegians are accustomed to variation and may perceive Danish and Swedish only as slightly more distant dialects. This is because they have two official written standards, in addition to the habit of strongly holding on to local dialects. The people of Stockholm, Sweden and Copenhagen, Denmark have the greatest difficulty in understanding other Scandinavian languages. In the Faroe Islands and Iceland, learning Danish is mandatory. This causes Faroese people as well as Icelandic people to become bilingual in two very distinct North Germanic languages, making it relatively easy for them to understand the other two Mainland Scandinavian languages. Although Iceland was under the political control of Denmark until a much later date (1918), very little influence and borrowing from Danish has occurred in the Icelandic language. Icelandic remained the preferred language among the ruling classes in Iceland. Danish was not used for official communications, most of the royal officials were of Icelandic descent and the language of the church and law courts remained Icelandic. The Scandinavian languages are (as a language family) unrelated to Finnish, Estonian and Sami languages, which as Uralic languages are distantly related to Hungarian. Owing to the close proximity, there is still a great deal of borrowing from the Swedish and Norwegian languages in the Finnish and Sami languages. The long history of linguistic influence of Swedish on Finnish is also due to the fact that Finnish, the language of the majority in Finland, was treated as a minority language while Finland was part of Sweden. Finnish-speakers had to learn Swedish in order to advance to higher positions. Swedish spoken in today's Finland includes a lot of words that are borrowed from Finnish, whereas the written language remains closer to that of Sweden. Finland is officially bilingual, with Finnish and Swedish having mostly the same status at national level. Finland's majority population are Finns, whose mother tongue is either Finnish (approximately 95%), Swedish or both. The Swedish-speakers live mainly on the coastline starting from approximately the city of Porvoo (in the Gulf of Finland) up to the city of Kokkola (in the Bay of Bothnia). The Åland Islands, an autonomous province of Finland situated in the Baltic Sea between Finland and Sweden, are entirely Swedish-speaking. Children are taught the other official language at school: for Swedish-speakers this is Finnish (usually from the 3rd grade), while for Finnish-speakers it is Swedish (usually from the 3rd, 5th or 7th grade). Finnish speakers constitute a language minority in Sweden and Norway. There are also languages derived from Finnish, having evolved separately, known as Meänkieli in Sweden and Kven in Norway. For a more in-depth look at the history of the region, see History of Scandinavia. Extension of Norse language in 900 A.D.: Western Norse in red and Eastern Norse in orange. The three Scandinavian kingdoms joined in 1387 in the Kalmar Union under Queen Margaret I of Denmark. Sweden left the union in 1523 under King Gustav Vasa. In the aftermath of Sweden's secession from the Kalmar Union, civil war broke out in Denmark and Norway—the Protestant Reformation followed. When things had settled, the Norwegian Privy Council was abolished—it assembled for the last time in 1537. A personal union, entered into by the kingdoms of Denmark and Norway in 1536, lasted until 1814. Three sovereign successor states have subsequently emerged from this unequal union: Denmark, Norway and Iceland. The borders between the three countries got the shape they have had since in the middle of the seventeenth century: In the 1645 Treaty of Brömsebro, Denmark–Norway ceded the Norwegian provinces of Jämtland, Härjedalen and Idre and Särna, as well as the Baltic Sea islands of Gotland and Ösel (in Estonia) to Sweden. 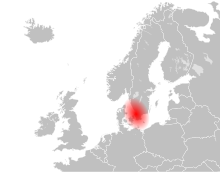 The Treaty of Roskilde, signed in 1658, forced Denmark–Norway to cede the Danish provinces Scania, Blekinge, Halland, Bornholm and the Norwegian provinces of Båhuslen and Trøndelag to Sweden. The 1660 Treaty of Copenhagen forced Sweden to return Bornholm and Trøndelag to Denmark–Norway, and to give up its recent claims to the island Funen. In the east, Finland, was a fully incorporated part of Sweden since medieval times until the Napoleonic wars, when it was ceded to Russia. Despite many wars over the years since the formation of the three kingdoms, Scandinavia been politically and culturally close. Denmark–Norway as a historiographical name refers to the former political union consisting of the kingdoms of Denmark and Norway, including the Norwegian dependencies of Iceland, Greenland and the Faroe Islands. The corresponding adjective and demonym is Dano-Norwegian. During Danish rule, Norway kept its separate laws, coinage and army as well as some institutions such as a royal chancellor. Norway's old royal line had died out with the death of Olav IV in 1387, but Norway's remaining a hereditary kingdom became an important factor for the Oldenburg dynasty of Denmark–Norway in its struggles to win elections as kings of Denmark. 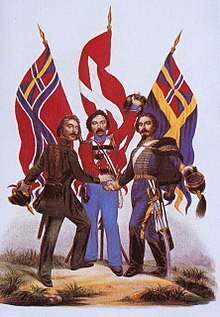 The influence of Scandinavism as a Scandinavist political movement was in the middle of the nineteenth century between the First Schleswig War (1848–1850) and the Second Schleswig War (1864). The end of the Scandinavian political movement came when Denmark was denied the military support promised from Sweden and Norway to annex the (Danish) Duchy of Schleswig, which together with the (German) Duchy of Holstein had been in personal union with Denmark. The Second war of Schleswig followed in 1864, a brief but disastrous war between Denmark and Prussia (supported by Austria). Schleswig-Holstein was conquered by Prussia and after Prussia's success in the Franco-Prussian War a Prussian-led German Empire was created and a new power-balance of the Baltic sea countries was established. Scandinavian Monetary Union, established in 1873, lasted until World War I. ^ a b c "Scandinavia". Encyclopædia Britannica. 2009. Retrieved 28 October 2009. Scandinavia, historically Scandia, part of northern Europe, generally held to consist of the two countries of the Scandinavian Peninsula, Norway and Sweden, with the addition of Denmark. Some authorities argue for the inclusion of Finland on geologic and economic grounds and of Iceland and the Faroe Islands on the grounds that their inhabitants speak Scandinavian languages related to those of Norway and Sweden and also have similar cultures. ^ a b "Languages". Nordic Cooperation. Archived from the original on 5 July 2017. Retrieved 8 July 2017. ^ a b Landes, David (1 July 2009). "Swedish becomes official 'main language'". The Local (Se). Retrieved 8 July 2017. ^ a b c "Facts about the Nordic region". 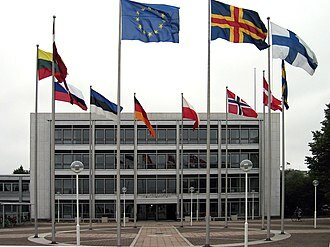 Nordic Council of Ministers & Nordic Council. 1 October 2007. Archived from the original on 8 February 2018. Retrieved 25 March 2014. Denmark, Finland, Iceland, Norway, Sweden and the Faroe Islands, Greenland and Åland work together in the official Nordic co-operation. ^ a b c d Østergård, Uffe (1997). "The Geopolitics of Nordic Identity – From Composite States to Nation States". The Cultural Construction of Norden. Øystein Sørensen and Bo Stråth (eds. ), Oslo: Scandinavian University Press 1997, 25–71. Also published online at Danish Institute for International Studies Archived 14 November 2007 at the Wayback Machine. For the history of cultural Scandinavism, see Oresundstid's articles The Literary Scandinavism and The Roots of Scandinavism. Retrieved 19 January 2007. ^ "Scandinavia". Microsoft Encarta Online Encyclopedia. Microsoft Corporation. 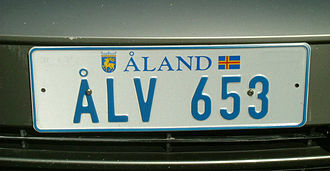 1997–2007. Archived from the original on 1 November 2009. Retrieved 30 January 2007. Scandinavia (ancient Scandia), name applied collectively to three countries of northern Europe—Norway, Sweden (which together form the Scandinavian Peninsula) and Denmark. ^ "Scandinavia". The Merriam-Webster Online Dictionary. 2008. Retrieved 9 January 2008. Scandinavia: Denmark, Norway, Sweden—sometimes also considered to include Iceland, the Faeroe Islands, & Finland. ^ Lonely Planet Scandinavian Europe. 2009. ^ The Rough Guide to Scandinavia. 2008. ^ "Official Site of Scandinavian Tourist Board of North America". 2009. Retrieved 23 October 2008. ^ "Introduction: Reflections on Political Thought in Finland." Editorial. Redescriptions, Yearbook of Political Thought and Conceptual History, 1997, Volume 1, University of Jyväskylä, pp. 6–7: "[T]he populist opposition both to Sweden as a former imperial country and especially to Swedish as the language of the narrow Finnish establishment has also been strong, especially in the inter-war years. [...] Finland as a unitary and homogeneous nation-state was constructed [...] in opposition to the imperial models of Sweden and Russia." ^ Haugen, Einar (1976). The Scandinavian Languages: An Introduction to Their History. Cambridge, Massachusetts: Harvard University Press, 1976. ^ a b c Knut Helle (2003). The Cambridge History of Scandinavia: Prehistory to 1520. Cambridge University Press. ISBN 978-0-521-47299-9. ^ John McKinnell (2005). Meeting the other in Norse myth and legend. Ds Brewer. p. 63. ISBN 978-1-84384-042-8. ^ Oskar Bandle (2002). The Nordic languages: an international handbook of the history of the North Germanic languages. Mouton De Gruyter. p. 358. ISBN 978-3-11-014876-3. ^ Malone, Kemp (1924). "Ptolemy's Skandia". The American Journal of Philology, Vol. 45, No. 4. (1924), pp. 362–70. ^ Stadius, Peter (2001). "Southern Perspectives on the North: Legends, Stereotypes, Images and Models" Archived 25 October 2007 at the Wayback Machine. BaltSeaNet Working Paper 3, The Baltic Sea Area Studies, Gdansk/Berlin, 2001. Online version retrieved 2 October 2007. ^ Erik Björkman (1973). Studien zur englischen Philologie. Max Niemeyer. p. 99. ISBN 978-3-500-28470-5. ^ a b Richard North (1997). Heathen gods in Old English literature. Cambridge University Press. p. 192. ISBN 978-0-521-55183-0. 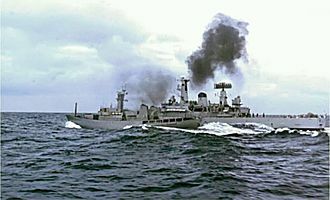 ^ a b J. F. Del Giorgio (24 May 2006). The Oldest Europeans: Who Are We? Where Do We Come From? What Made European Women Different?. A J Place. ISBN 978-980-6898-00-4. ^ Uścinowicz, Szymon (2003). "How the Baltic Sea was changing" Archived 12 December 2007 at the Wayback Machine. Marine Geology Branch, Polish Geological Institute, 9 June 2003. Retrieved 13 January 2008. ^ Battaglia, Steven M. (2019-01-02). "Shifting Weather Patterns in a Warming Arctic: The Scandes Case". Weatherwise. 72 (1): 23–29. doi:10.1080/00431672.2019.1538761. ^ Dirmid R. F. Collis (1990). Arctic languages: an awakening. Unipub. p. 440. ISBN 978-92-3-102661-4. ^ Aschehoug og Gyldendals store norske leksikon: Nar – Pd. 1999. ISBN 978-82-573-0703-5. ^ Bernd Heine; Tania Kuteva (2006). The changing languages of Europe. Oxford University Press, US. ISBN 978-0-19-929734-4. ^ Iben Stampe Sletten; Nordisk Ministerråd (2005). Nordens sprog med rødder og fødder. p. 2. ISBN 978-92-893-1041-3. ^ Holmarsdottir, H. B. (2001). "Icelandic: A Lesser-Used Language in the Global Community". International Review of Education/ Internationale Zeitschrift Fr Erziehungswissenschaft/ Revue Inter. 47 (3/4): 379. Bibcode:2001IREdu..47..379H. doi:10.1023/A:1017918213388. ^ Hálfdanarson, Guðmundur. Icelandic Nationalism: A Non-Violent Paradigm? Archived 1 October 2008 at the Wayback Machine In Nations and Nationalities in Historical Perspective. Pisa: Edizioni Plus, 2001, p. 3. ^ a b c Inez Svonni Fjällström (2006). "A language with deep roots" Archived 5 October 2007 at the Wayback Machine.Sápmi: Language history, 14 November 2006. 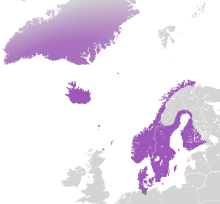 Samiskt Informationscentrum Sametinget: "The Scandinavian languages are Northern Germanic languages. 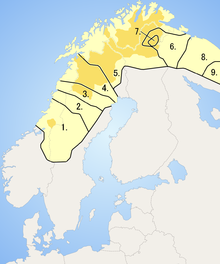 [...] Sami belongs to the Finno-Ugric language family. Finnish, Estonian, Livonian and Hungarian belong to the same language family and are consequently related to each other." ^ Suzanne Romaine (1995). Bilingualism. Wiley-Blackwell. p. 323. ISBN 978-0-631-19539-9. ^ Oskar Bandle (March 2005). The Nordic languages: an international handbook of the history of the North Germanic languages. Walter de Gruyter. p. 2115. ISBN 978-3-11-017149-5. ^ Oskar Bandle (2002). The Nordic languages: an international handbook of the history of the North Germanic languages. Mouton De Gruyter. ISBN 978-3-11-014876-3. Look up scandinavia in Wiktionary, the free dictionary. Wikisource has the text of the 1911 Encyclopædia Britannica article Scandinavian Civilization. "Scandinavia: Official Website of the Scandinavian Tourist Boards in North America". Scandinavian Tourist Boards in North America, Globescope Internet Services, Inc. 2005. Retrieved 5 September 2008. The Scandinavian Peninsula became ice-free around 11,000 BC, at the end of the last ice age. The Nordic Stone Age begins at time, with the Upper Paleolithic Ahrensburg culture. 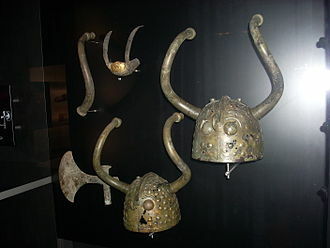 The Neolithic stage is marked by the Funnelbeaker culture, followed by the Pitted Ware culture, around 2800 BC, metal was introduced in Scandinavia in the Corded Ware culture. 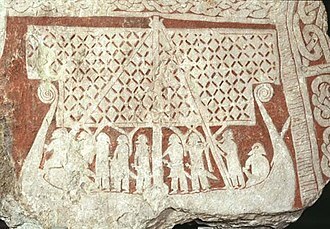 In much of Scandinavia, a Battle Axe culture became prominent, the period 2500 BC –500 BC left many visible remains to modern times, most notably the many thousands rock carvings in western Sweden at Tanumshede and in Norway at Alta. 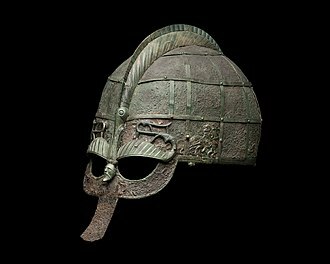 A more advanced culture came with the Nordic Bronze Age and it was followed by the Iron Age by the 4th century BC. The pre-history of Sweden begins at the end of the Pleistocene epoch at the beginning of Holocene epoch, following the last ice age, at the end of the ice age, large parts of south and middle Sweden were covered by water. Parts of Denmark and the Norwegian coast line were free from ice around 13000 BC and it wasnt until 7000 BC that all of Svealand and the modern coastal regions of North-eastern Sweden were free of ice, although the land was by deeply pressed underwater. By this time and Sweden were joined and the Baltic Sea of the age was a fresh water lake called the Ancylus Lake, the Ancylus age is followed by formation of the Littorina Sea and the Litorina Stage at around 6200 BC. With the first human colonization of new land during the Ancylus. As the ice receded reindeer grazed on the plains of Denmark and this was the land of the Ahrensburg culture, whose members hunted over territories 100000 km² vast and lived in teepees on the tundra. On this land there was little forest but arctic white birch and rowan, in the 7th millennium BC, when the reindeer and their hunters had moved for northern Scandinavia, forests had been established in the land. Utilizing fire and stone tools enabled these Stone Age inhabitants to survive life in northern Europe, the northern hunter/gatherers followed the herds and the salmon runs, moving south during the winters, moving north again during the summers. The Maglemosian people lived in forest and wetland environments using fishing and hunting tools made from wood, bone, a characteristic of the culture are the sharply edged microliths of flintstone which were used for spear heads and arrowheads. Svalbard is a Norwegian archipelago in the Arctic Ocean. Situated north of mainland Europe, it is midway between continental Norway and the North Pole. 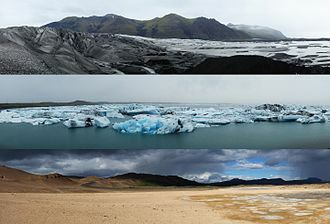 The islands of the range from 74° to 81° north latitude. The largest island is Spitsbergen, followed by Nordaustlandet and Edgeøya, the archipelago is not part of any Norwegian county, but forms an unincorporated area administered by a governor appointed by the Norwegian government. Since 2002, Svalbards main settlement, has had a local government. 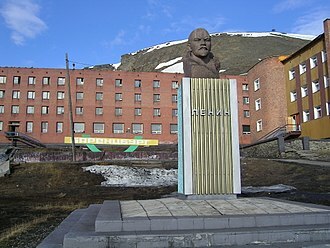 Other settlements include the Russian mining community of Barentsburg, the station of Ny-Ålesund. Svalbard is the northernmost settlement in the world with a permanent civilian population, other settlements are farther north, but are populated only by rotating groups of researchers. 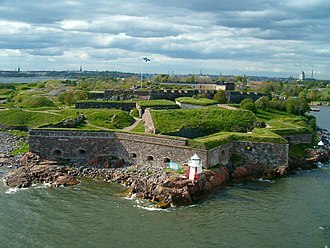 The islands were first taken into use as a base in the 17th and 18th centuries. 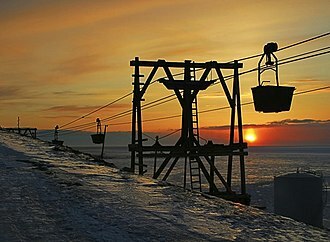 Coal mining started at the beginning of the 20th century, the Svalbard Treaty of 1920 recognizes Norwegian sovereignty, and the 1925 Svalbard Act made Svalbard a full part of the Kingdom of Norway. 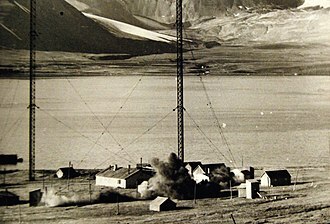 They established Svalbard as an economic zone and a demilitarized zone. The Norwegian Store Norske and the Russian Arktikugol remain the mining companies in place. 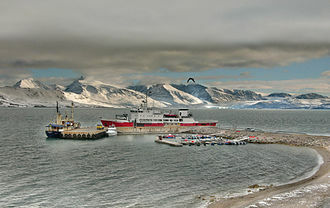 Research and tourism have become important supplementary industries, with the University Centre in Svalbard, no roads connect the settlements, instead snowmobiles and boats serve inter-community transport. Svalbard Airport, Longyear serves as the main gateway, the archipelago features an Arctic climate, although with significantly higher temperatures than other areas at the same latitude. The flora take advantage of the period of midnight sun to compensate for the polar night. Svalbard is a ground for many seabirds, and features polar bears, the Arctic fox. Seven national parks and twenty-three nature reserves cover two-thirds of the archipelago, protecting the largely untouched, yet fragile, approximately 60% of the archipelago is covered with glaciers, and the islands feature many mountains and fjords. 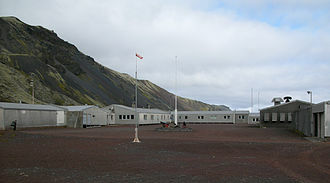 Svalbard and Jan Mayen are collectively assigned the ISO 3166-1 alpha-2 country code SJ, both areas are administered by Norway, though they are separated by a distance of over 500 nautical miles and have very different administrative structures. The Nordic Stone Age refers to the Stone Age of Scandinavia. As the ice receded, reindeer grazed on the plains of Denmark and southernmost Sweden, while along the coast of western Sweden, marine resources were exploited. This was the land of the Ahrensburg culture and preceding Hamburg culture, tribes who hunted over territories 100,000 km² vast, on this land there was little forest but arctic white birch and rowan, but the taiga slowly appeared. 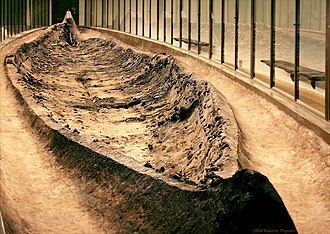 In the 7th millennium BCE, the climate in Scandinavia was warming as it transitioned from the former Boreal age to the Atlantic period and their hunters had already migrated and inhabited the lands of northern Scandinavia, and forests had established. 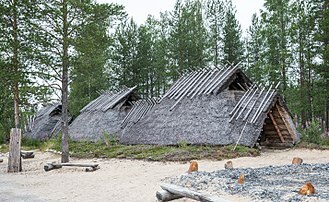 A culture called the Maglemosian culture lived in the areas of Denmark, to the north, in Norway and along the coast of western Sweden, the Fosna-Hensbacka culture was living mostly in changing seasonal camps along the shores and close to the now thriving forests. Utilizing fire and stone tools, these Stone Age tribal cultures managed to survive in northern Europe, the northern hunter-gatherers followed the herds and the salmon runs, moving south during the winters, moving north again during the summers. During the 6th millennium BCE, the climate of Scandinavia was generally warmer and more humid than today, large animals like aurochs, wisent and red deer roamed freely in the forests and was hunting game for tribes of what we now call the Kongemose culture. Like their predecessors, the Kongemose tribes hunted animals such as seals. North of the Kongemose people, lived other hunter-gatherers in most of southern Norway and Sweden, now dubbed the Nøstvet and Lihult cultures, descendants of the Fosna and Hensbacka cultures. During the 5th millennium BCE, the Ertebølle people learned pottery from neighbouring tribes in the south, they too started to cultivate the land and, ca 4000 BCE, they became part of the megalithic Funnelbeaker culture. During the 4th millennium BCE, these Funnelbeaker tribes expanded into Sweden up to Uppland, the Nøstvet and Lihult tribes learned new technology from the advancing farmers, but not agriculture, and became the Pitted Ware cultures, towards the end of the 4th millennium BCE. The Great Northern War was a conflict in which a coalition led by the Tsardom of Russia successfully contested the supremacy of the Swedish Empire in Central and Eastern Europe. 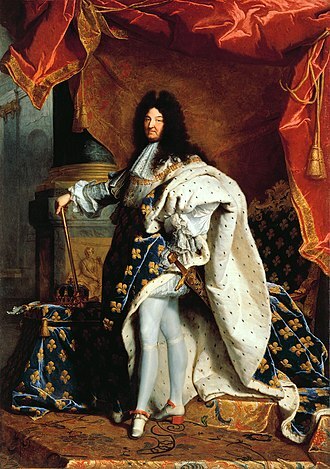 The initial leaders of the alliance were Peter I of Russia, Frederick IV of Denmark–Norway. 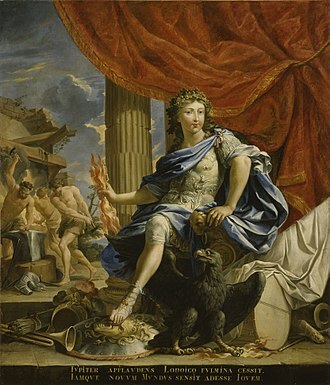 George I of Great Britain and of Brunswick-Lüneburg joined the coalition in 1714 for and for Hanover in 1717, Charles XII led the Swedish army. Swedish allies included Holstein-Gottorp, several Polish magnates under Stanisław I Leszczyński, the Ottoman Empire temporarily hosted Charles XII of Sweden and intervened against Peter I. The treaty secured the extradition and execution of Johann Reinhold Patkul, the Ottoman Empire defeated the Russian-Moldavian army in the Pruth River Campaign, but that peace treaty was in the end without great consequence to Russias position. After Poltava, the anti-Swedish coalition revived and subsequently Hanover and Prussia joined it, the remaining Swedish forces in plague-stricken areas south and east of the Baltic Sea were evicted, with the last city, falling in 1710. The coalition members partitioned most of the Swedish dominions among themselves, Sweden proper was invaded from the west by Denmark–Norway and from the east by Russia, which had occupied Finland by 1714. 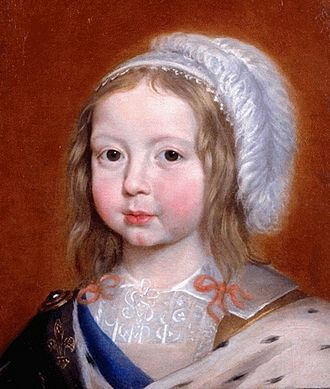 Sweden defeated the Danish invaders at the Battle of Helsingborg, Charles XII opened up a Norwegian front, but was killed in Fredriksten in 1718. The war ended with Swedens defeat, leaving Russia as the new dominant power in the Baltic region, by these treaties Sweden ceded her exemption from the Sound Dues, and lost the Baltic provinces and the southern part of Swedish Pomerania. The peace treaties ended her alliance with Holstein-Gottorp, Hanover gained Bremen-Verden, Brandenburg-Prussia incorporated the Oder estuary, Russia secured the Baltic Provinces, and Denmark strengthened her position in Schleswig-Holstein. 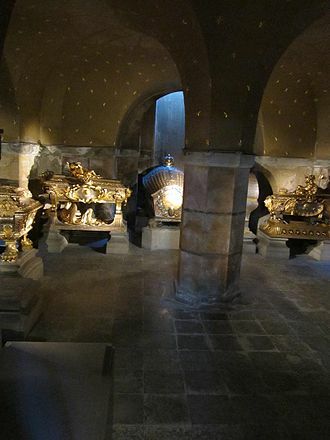 In Sweden, the monarchy had come to an end with the death of Charles XII. Between the years of 1560 and 1658, Sweden created a Baltic empire centred on the Gulf of Finland and comprising the provinces of Karelia, Ingria and Livonia. fi is the Internet country code top-level domain for Finland. It is operated by FICORA, the Finnish Communications Regulatory Authority, on 4 December 1986, an application to register top level domain for Finland was sent by Finnish Unix Users Group from Tampere. The application was accepted and the administration of. fi TLD was granted to Tampere University of Technology, the administration was transferred first to FICIX and to FICORA. In the past FICORA regulated. fi domains very strictly, Domain names were only admitted to company names or companies that owned trademarks. This policy led to Finnish companies applying for domains under other top-level domains, the policy was changed on 1st September 2003. Since September 2016 anyone worldwide is permitted to register domain names under the. fi TLD, since 1st September 2005. fi domains may contain Scandinavian letters, though they are not recommended to be used as the primary domain. Since 1st March 2006, private persons have been able to apply for a domain name, some restrictions still apply, for example, company names or trademarks can only be applied for by the companies concerned. The history of Scandinavia is the history of the region of northern Europe comprising Denmark and Sweden. Finland and Iceland are at times considered part of Scandinavia, one important collection that exists, however, is a widespread and rich collection of stone drawings known as petroglyphs. As the ice receded, Reindeer grazed on the lands of Denmark. This was the land of the Ahrensburg culture, tribes who hunted over vast territories, there was little forest in this region except for arctic white birch and rowan, but the taiga slowly appeared. 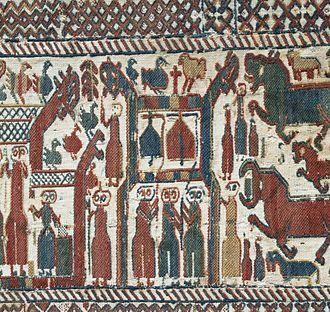 In the 7th millennium BC, when the reindeer and their hunters had moved for northern Scandinavia, the Maglemosian culture lived in Denmark and southern Sweden. To the north, in Norway and most of southern Sweden, lived the Fosna-Hensbacka culture, the northern hunter/gatherers followed the herds and the salmon runs, moving south during the winters, moving north again during the summers. During the 6th millennium BC, southern Scandinavia was covered in temperate broadleaf, fauna included aurochs, wisent and red deer. The Kongemose culture was dominant in this time period and they hunted seals and fished in the rich waters. North of the Kongemose people lived other hunter-gatherers in most of southern Norway and Sweden called the Nøstvet and Lihult cultures, descendants of the Fosna, near the end of the 6th millennium BC, the Kongemose culture was replaced by the Ertebølle culture in the south. During the 5th millennium BC, the Ertebølle people learned pottery from neighbouring tribes in the south and they too started to cultivate the land, and by 3000 BC they became part of the megalithic Funnelbeaker culture. During the 4th millennium BC, these Funnelbeaker tribes expanded into Sweden up to Uppland, the Nøstvet and Lihult tribes learnt new technology from the advancing farmers and became the Pitted Ware cultures towards the end of the 4th millennium BC. At least one settlement appears to be mixed, the Alvastra pile-dwelling and this new people advanced up to Uppland and the Oslofjord, and they probably provided the language that was the ancestor of the modern Scandinavian languages. Von Kármán vortex street created by Beerenberg volcano in the westerly winds. Petroglyphs from Scandinavia (Häljesta, Västmanland in Sweden). Composite image. 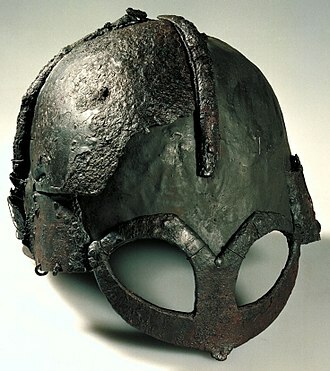 Nordic Bronze Age. The glyphs are painted to make them more visible. It is unknown whether they were painted originally. Ivar Samuelsen, Sea Saami (Sami, Sapmi) Man from Finnmark in Norwegian Lapland. 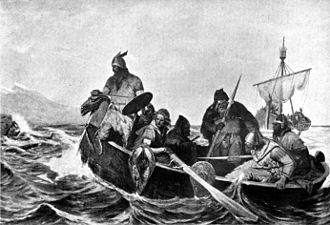 During the Christianization of Norway, King Olaf ordered male völvas (seidmen) tied and left on a skerry at ebb, resulting in a protracted death by drowning and the securing of Christian hegemony in the Norwegian kingdom. Gold jewellery from the 10th century Hiddensee treasure, mixing Norse pagan and Christian symbols. Stone Dolmen near Vinstrup, Nørhald. Built in the 3rd millennium BC. 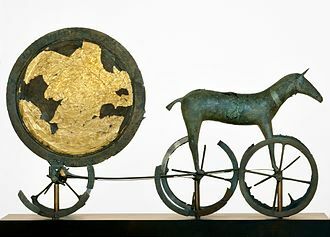 The famous Trundholm sun chariot (called Solvognen in Danish), a sculpture of the sun pulled by a mare. Scholars have dated it to some time in the 15th century BC and believe that it illustrates an important concept expressed in Nordic Bronze Age mythology. The silver Gundestrup Cauldron, with what some scholars interpret as Celtic depictions, exemplifies the trade relations of the period. The extent of the Danish Realm before the expansion of the Viking Age. It is not known when, but the tribal Danes divided the realm into "herreder" (marked by red lines). Danish Altona burned down during Stenbock's campaign (1713). Russian forces retaliated by burning down Swedish Wolgast (same year). Viking age picture stone, Gotland. 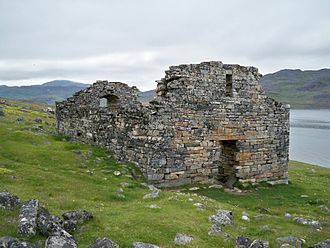 The last written records of the Norse Greenlanders are from a 1408 marriage in the Church of Hvalsey. Flake axe typical of the Ertebølle culture. 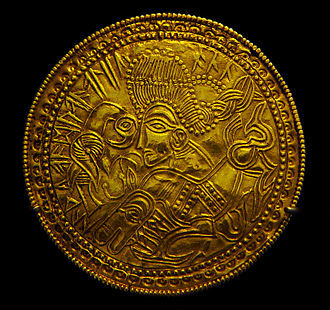 A Migration Period Germanic gold bracteate featuring a depiction of a bird, horse, and stylized head wearing a Suebian knot sometimes theorized to represent the Germanic god Wōden and what would later become Sleipnir and Hugin or Munin in Germanic mythology, later attested to in the form of Norse mythology. The runic inscription includes the religious term alu.